A while back, we talked about the drink machine as a metaphor for tantrum behavior. If you have not read that one…go ahead, so we can move on . You should learn here that if you know the behavior is likely to occur under a particular circumstance you need to sit and think about why and see if there is a way you can set things up to prevent the event from occurring in the first place and make the appropriate behavior more likely to occur. Truly, this in where the answers are. Here is the deal, if you do anything to stop it in the moment, you are probably making it more likely to occur again under similar circumstances. That’s just the reality of how behavior works…anything that will stop a tantrum in its tracks is very likely reinforcing it (letting the behavior work). NOT what you want if it occurs time and time again. Now, is one event going to teach a behavior? RARELY. Are you going to suffer the fate of a tantrummy kid every time you go to a family day at your office because you gave him a bit of a “hush” cookie that one time he was being difficult and your boss and his family were watching? No. So the idea here is about consistency…which gets us back to the first point: making sure you are prepared next time. I know that is not what you want to hear at this point, I get it, but I also think you should get my point here as well. Here is what I tell families about these “OH &^*%” situations: I would much rather you reinforce (give in) at the beginning of a tantrum, fit or loud protest than at the end. I see this really as “management” rather than “intervention” or “treatment.” The point is to “stop the bleeding” while, at the same time, limiting the behaviors that are going to be reinforced in the process. If a behavior does not occur, it cant be reinforced. Its just that simple. Sometimes, I don’t want to even chance it that a more ridiculous behavior is going to happen because if it does, it might be less manageable and, at that point, I would have to give in to preserve my sanity, his safety and the Thomas Train display at the toy store. I would much rather reinforce a whine than a scream, you see. So in these situations, it is OK to delver the drink when he shakes the machine, knowing you will have to if he starts kicking it and making a real raucous event. 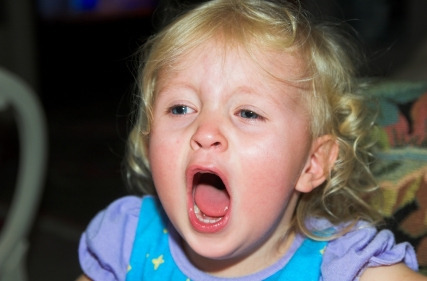 In the long run (the “next time” discussion), the notion is we have more options with a child who whines than one who throws things, so if you teach something, it is better to teach whining than throwing because whining is easier to get rid of in the future. Its OK…for now, but please learn from it for next time so you wont be put in the same situation. Please, PLEASE remember, if the behavior is consistent, you need to go back to the other posts mentioned above, send me a note, and change the way you are doing things…it isn’t an issue of “management” at the point that it becomes predictable.